Last of the Bristol Whisky Lounge today and the best of the day too. Last year the best whisky at the festival for me was Lp5 and this year I expected it to be one of the drams you had to pay for (last year I had no monies for the good stuff). 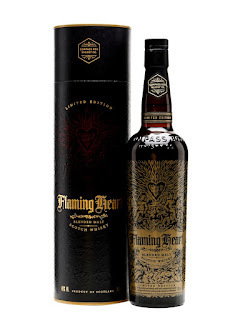 But when I waltzed up to the Compass Box table and asked to try Flaming Heart they just handed it over. Damn, should've gotten a sample too. In the end I bought a bottle. After last time (chronicled here and here) I'd avoided the Compass Box but after 4 hours of drinking I thought I should try something. 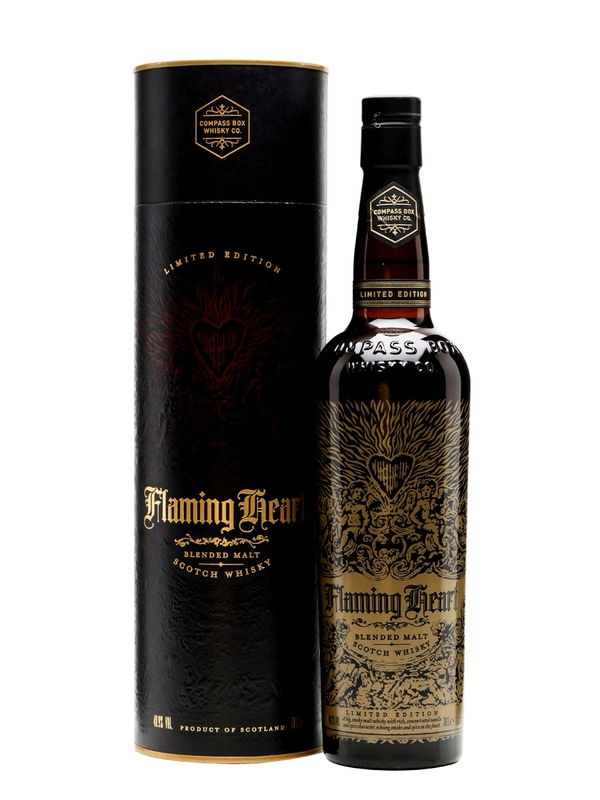 I wanted to try this anyway with so much old Caol Ila in it. Nose: Very complex. Quite closed at first, common for old Caol Ila in my experience, but opening up gradually. Great combination of fruit, smoke and oil. Soot, fresh lemon, apple, candle wax, camphor. Taste: Soft at first, building and building gradually, very complex. Great long development. Lemon, spice, smoke and malt. Finish: Long length. Mouth watering, oak and wax, sweet. Notes: Historic bottling. Great whisky. 39 casks, 38.5% 14yo Caol Ila from a refill Hogshead, 27.1% 30yo Caol Ila from a refill Hogshead, 24.1% 20yo Clynelish from a rejuvenated American Oak barrel and 10.3% 7yo blend of Clynelish, Teaninich and Dailuaine finished in a barrel with toasted French Oak heads for 2 years. At first I rated it 80, then after a few minutes 82, then 83/4. I finally decided on 85, but at the rate this was improving I had to buy a bottle! I'll have to give it the Glaser, this is expertly blended. Really interesting video on the recipe here. I know, I know. I should have tried TINALW too, but there's only so much a man can review in 5 hours.